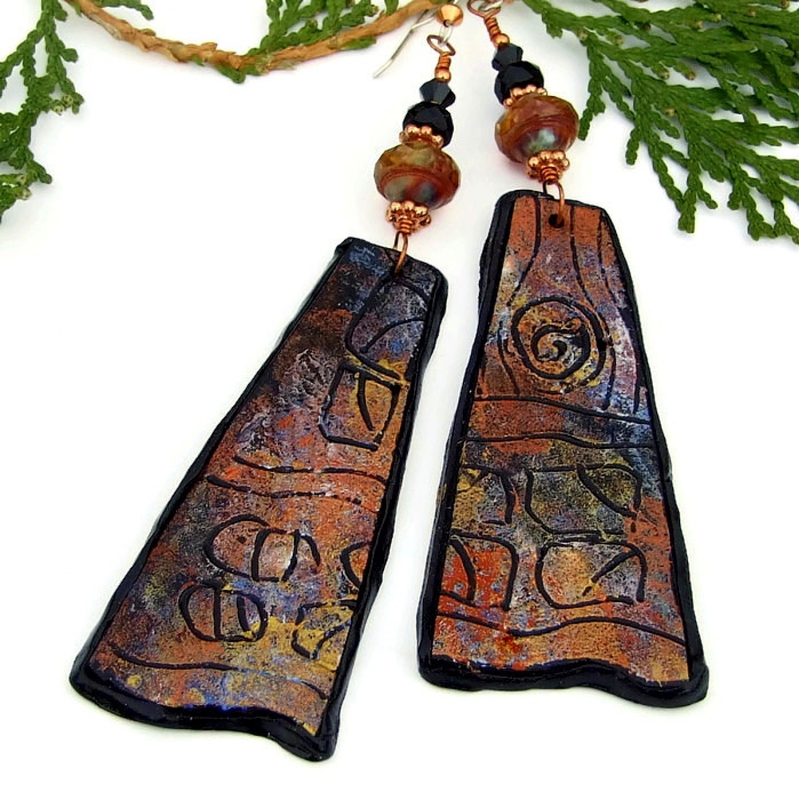 Big and bold, the unique ART OF THE ANCIENTS handmade earrings will definitely add a healthy dose of lightweight boho dazzle to your earlobes! 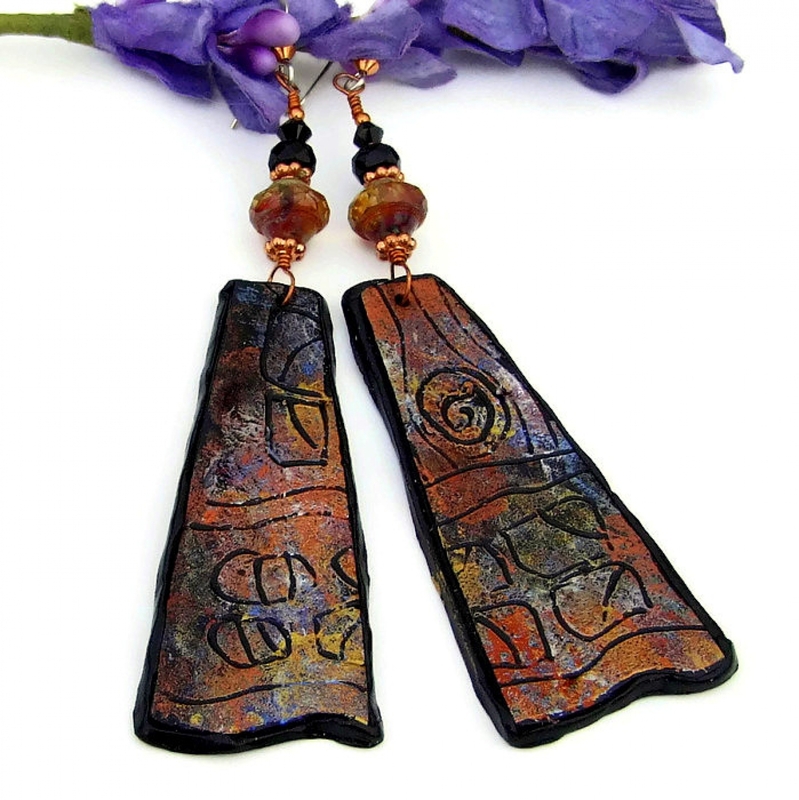 The rustic one of a kind earrings feature artisan handmade, petroglyph inspired polymer clay dangles in an etched and multicolored assortment of hand painted designs. Stacked above the rustic charms are glowing Czech glass Saturn beads, faceted black Czech glass rondelles and jet Swarovski crystals to perfectly complement the colors of the polymer clay pieces. 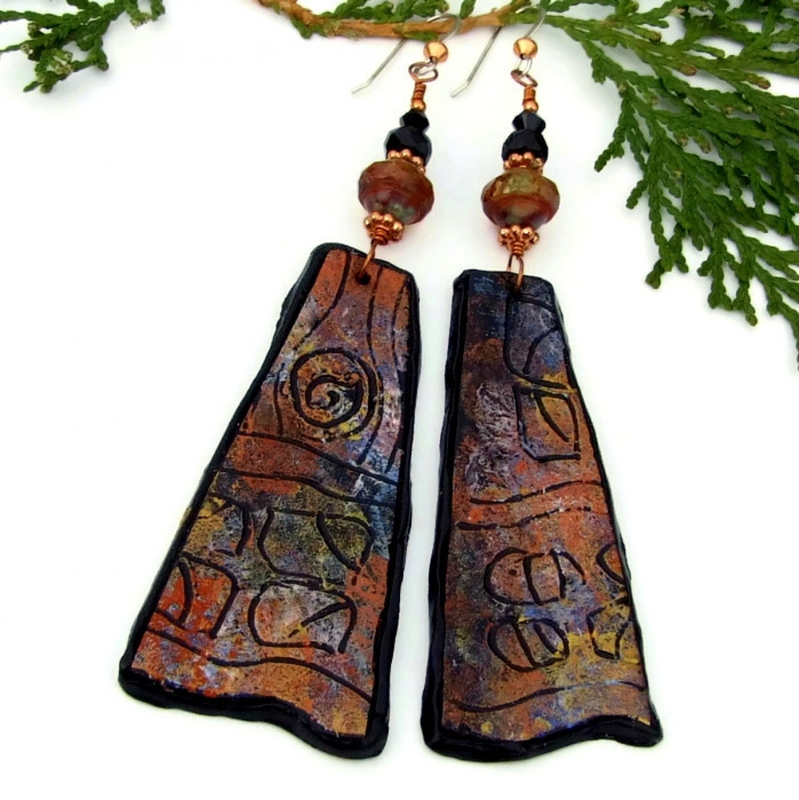 A perfect jewelry gift idea for the woman who appreciates wearable art and loves a boho look, the unique ART OF THE ANCIENTS artisan earrings were carefully designed and handmade by Catherine of Shadow Dog Designs. *** Please note: Despite being large earrings, they are very lightweight to wear since the major pieces are created from polymer clay. 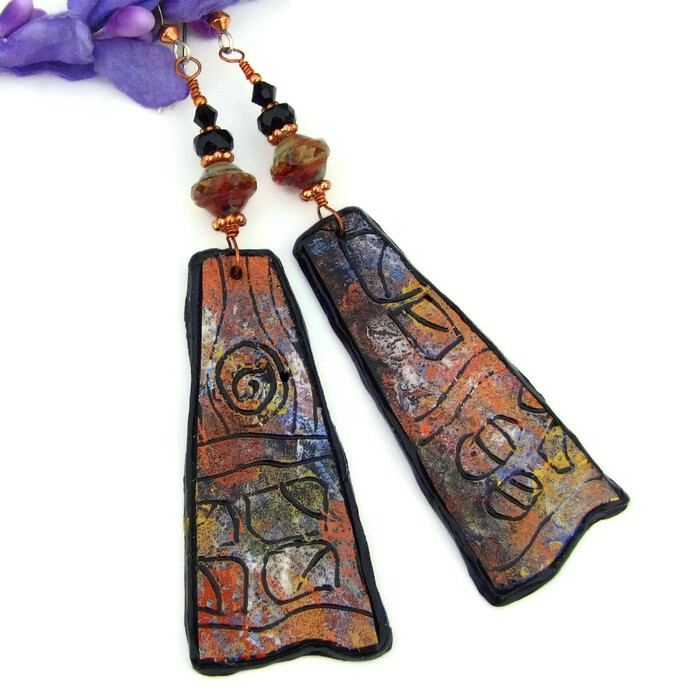 The glorious dangles used to create the ART OF THE ANCIENTS were created by polymer clay artist Pati Bannister. 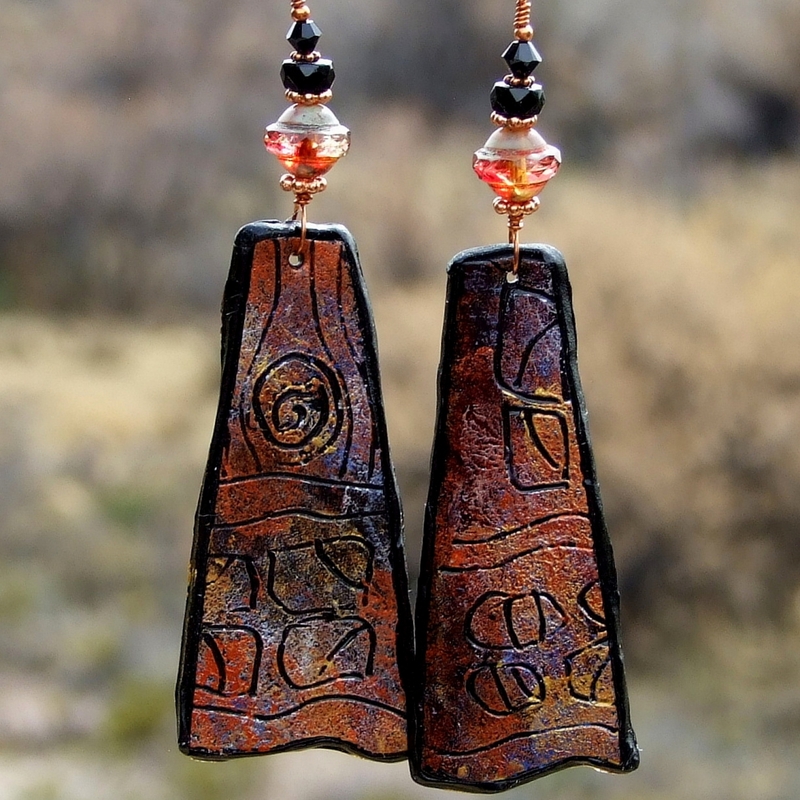 A freehand design inspired by the petroglyph art of the Desert Southwest, each long, triangular dangle was individually hand carved into black polymer clay with spirals, swirls flowing lines, and other designs. They were then painted with acrylic metallic pigments in various shades of gold, sunset orange, blue and pale green. As you can see, each charm is different but is very similar in look and feel. 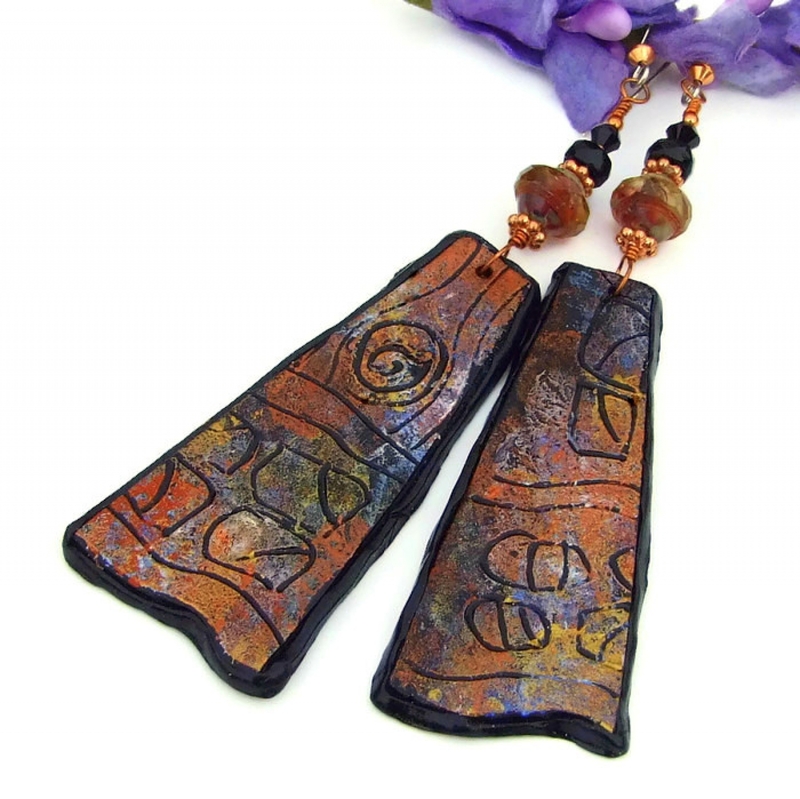 The back of each polymer clay dangle is signed by the artist and also painted. A light coat of crystal varnish was applied to each dangle, leaving them with a smooth, silky feel and an amazing sheen. Due to the metallic sheen of the paints, the rectangles do quite a bit of color shifting depending on the angle of the light, as you can see in the photos above. 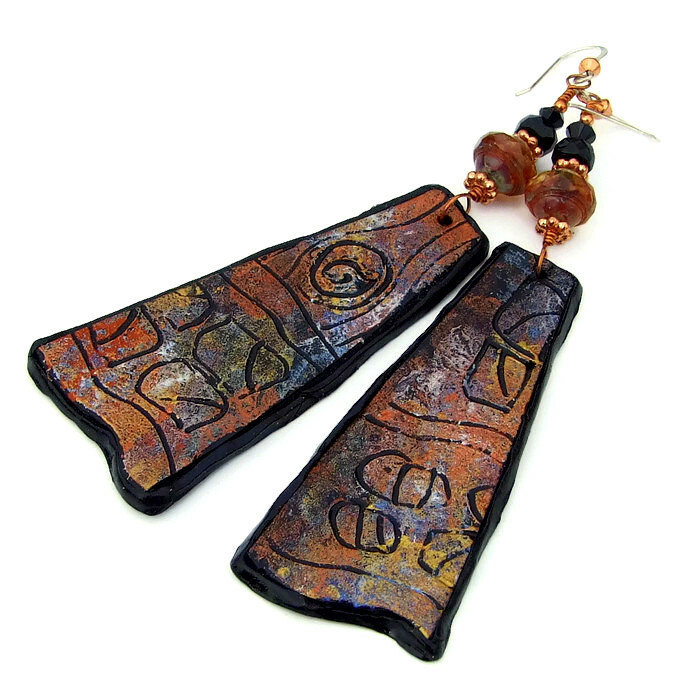 The colors are more similar to photos # 2 and # 6, the earrings shown hanging. 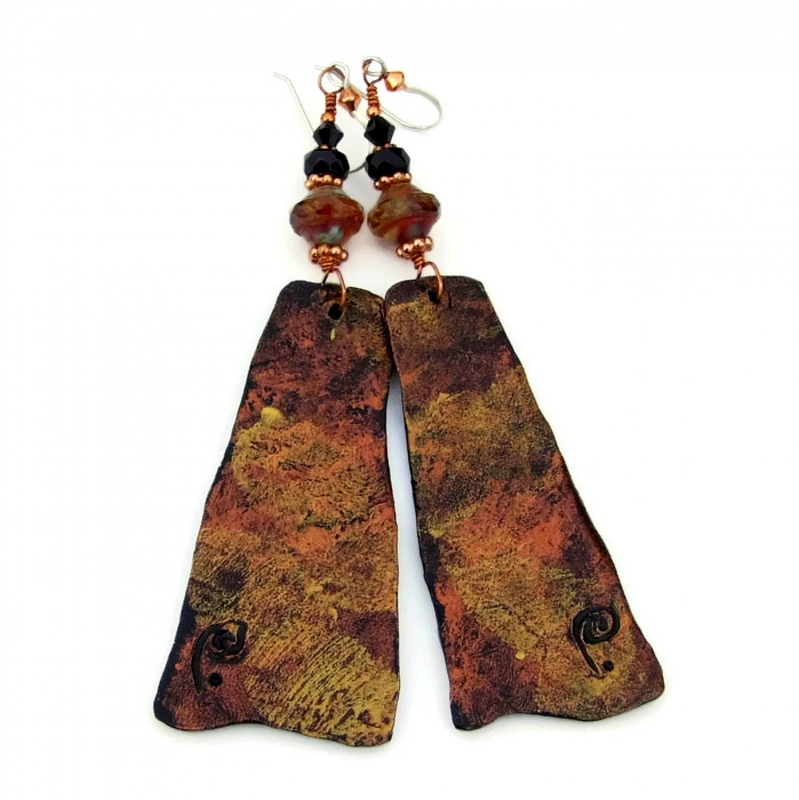 These lightweight, one of a kind beauties are, indeed, wearable art! 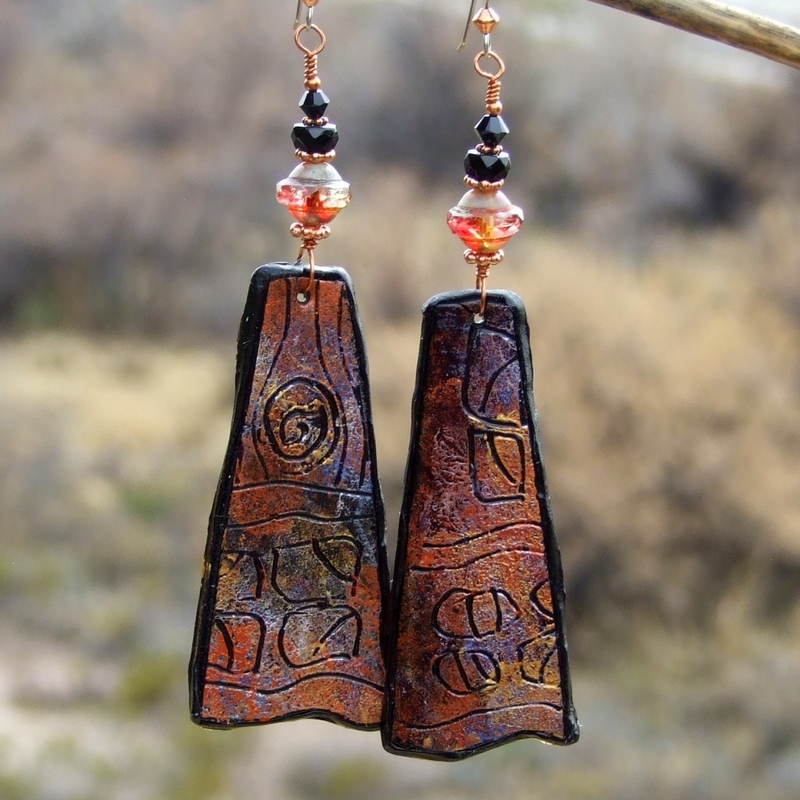 To brilliantly complement the colors of the rustic artisan polymer clay dangles, a Czech glass Saturn bead and black glass and crystals were added above the charms. The Saturn beads are varying shades of sangria red and clear glass with a lichen green / gray Picasso finish on the top and bottom of the beads. The raised center is crisply faceted for subtle sparkle. Above the Saturn beads, separated by copper daisy spacers, are faceted black Czech glass rondelles and sparkling “jet” black Swarovski crystals for even more sparkle. 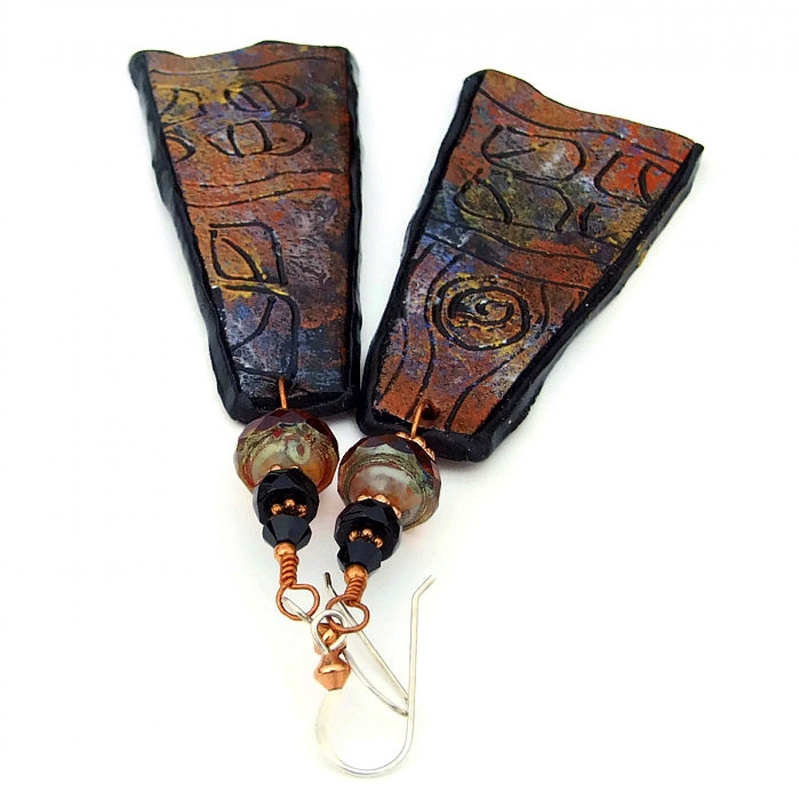 The unique earrings are finished with sterling silver French hook earwires with copper bead accents. 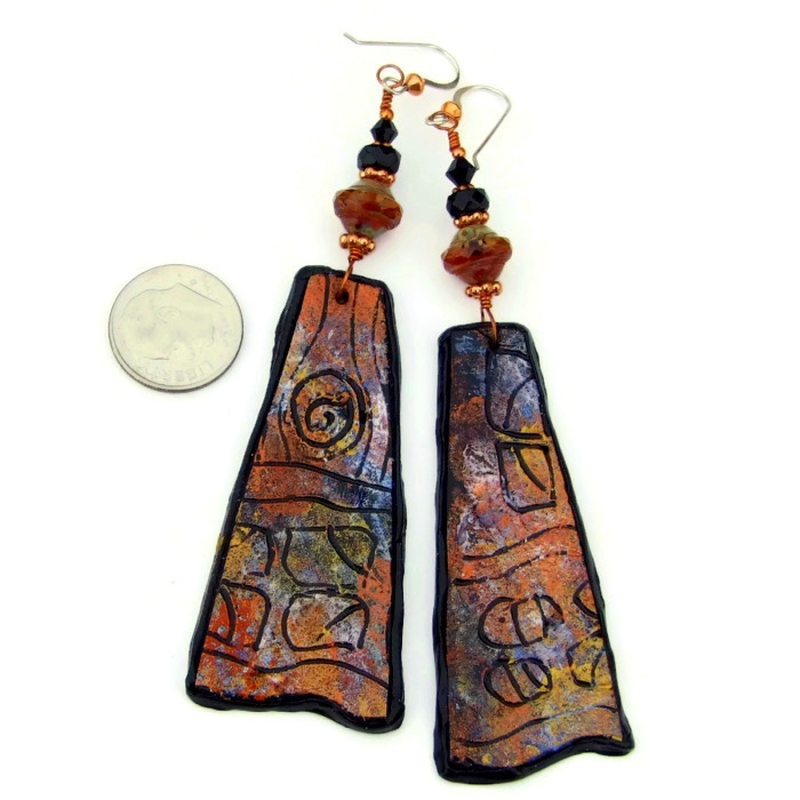 *** For a better understanding of the size of the unique ART OF THE ANCIENTS boho earrings, please see photo # 6 for a size comparison with a dime. 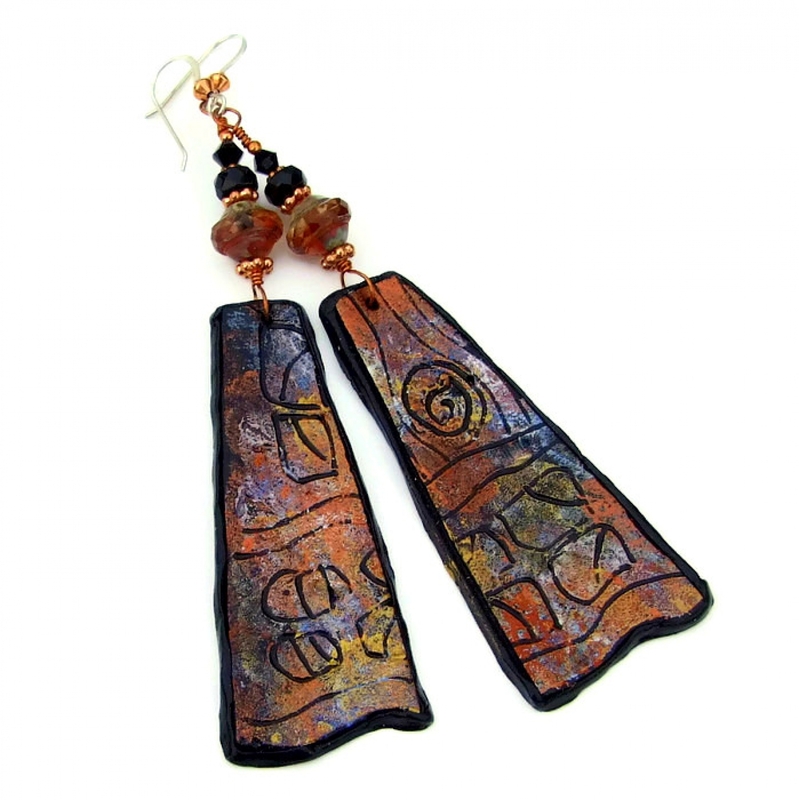 The ART OF THE ANCIENTS artisan boho earrings were carefully designed and handmade in a dog friendly, smoke free studio. They will be carefully packed in an organza jewelry bag with tissue, perfect for gift giving to a loved one . . . or to yourself!